It would seem that trifle* has very good taste because our favourite stand won Best in Show. Baux, known for wood wool acoustic panels, not only launched an exciting new acoustic panel that is 100% bio-based, but they built a serene Scandi "castle" clad entirely in the stuff to showcase it's beauty and acoustic properties (Lead images, above). Next on our list of favourites was Swedish Ninja's new C-lamp wall lights. These were a pop of fun, colourfully contrasting a show largely dominated by muted tones and a 1970s colour palette. We'll definitely be using these in a project soon. Another of our favourite stands was Menu, where we wanted to lay on/run our hands over e-ver-y-thing. And the trifle* award for Best New Brand (that we hadn't known about before!) goes to Munk Collective. Their lovely collections of perforated and powder coated metal furniture and lighting left us wanting more. 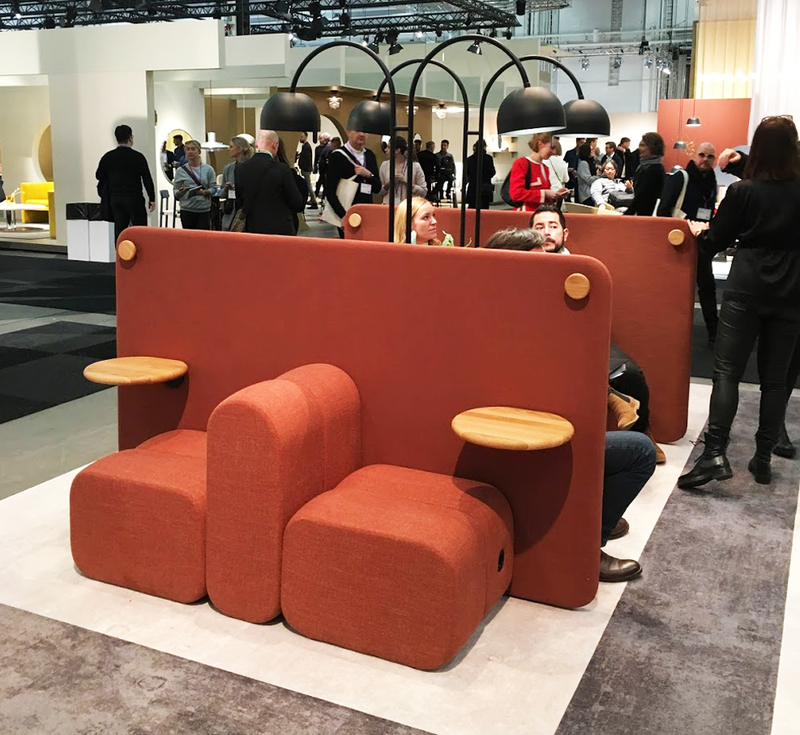 Bla Station's stand was all about Bob - their signature seating and their new lighting line in collaboration with Zero. Perfect for working individually or collaboratively away from your desk. Ever since we visited Fogia's stunning Stockholm showroom last November, we've been dreaming not only of getting some of their pieces into our projects, but also filling up our homes with their beautifully designed furniture and lighting. Inspired by Japanese gardens, it's no wonder we enjoyed a very zen break in The Design Bar by Anderssen & Voll. Aside from the incredible concentration of Scandi design at the Furniture Fair, we were able to get out and about to visit some other gorgeous spaces. We first stopped by hem's lovely high-ceilinged, shelfie-tastic showroom in Vasastan, and were pleased that they managed to get their remarkable pink blob desk (made by Soft Baroque) sent over from last year's London pop-up in one piece! We also got our first look at their new Rope Rug collection by Pauline Deltour, which would be perfect for a lounge or a meeting room. Next up, our massive design crush Form Us With Love, had us around to their studio for breakfast, and we have to say that we absolutely love everything they do. For design week, they were showcasing the Nest collection they designed for +Halle (pictured above). And you know Baux's 100% bio-based PULP acoustic panel we mentioned before? FUWL designed them. And Baux's award-winning stand. Amazing. We would be remiss not to mention the delicious pockets of heaven enjoyed in the form of kanelbulle. We visited a few different bakeries that were all incredible, butFabrique gets a special mention not only because we loved its pared back and cozy design, but also because we found out there are actually a couple here in London to satisfy all of our cinnamon bun cravings. Happy days! There were a couple of major design trends worth mentioning, which you'll probably have noted from previous images. First, corrugated textures were very popular, and you can even see how we've been in on the action here. Clockwise from top left: Note Design Studio's Arkad pouffes;Baux's PULP acoustic panel; Northern's stand; Magis' stand; Filippo Fabi's Rustica lights. And finally, that 70s palette was everywhere. We don't care what colour it is as long as you make it burnt orange, mustard yellow, pea green, and yes, even brown. Tack Stockholm, vi ses snart!